A particular young boy in our after school programme at Lawley Primary, loves City Year and always tells his mother, who works at the school, about the activities he does with us. One day his mother, Mrs. Kgosana, came up to us at lunch and said, “Just know that we as parents and the community are really grateful for what City Year is doing for our children. My son who is in grade 6 cannot close his mouth about how good and helpful you are to him.” She then kindly asked why City Year is not in high schools and we replied, laughing, that the answer to that question was above our pay grade. Mrs. Kgosana started telling us about Nomathemba, her 16 year old daughter in grade 10, who was failing maths. She asked us, “How can you help me to help my child out of this misery?” We said that we would think about it and talk it through with our Site Leader Alexi, to see if there was anything we could do to assist. The next day as we were about to wrap up, we heard a knock at the door and saw Mrs. Kgosana standing there with her daughter at her side. She said, “I am leaving her with City Year. See what you can do.” We were shocked and confused. We had not said yes, or even had the chance to speak to Alexi! But, we decided on the spot that we were going to help this girl, even if it meant staying behind every day after our work with City Year was complete. We decided to initiate our own programme, which would run immediately after the City Year Children’s Club, between 4:30pm and 6pm. Without wasting any time we started tutoring the young girl the same day that her mother brought her to us. First we motivated her, and made sure that she started off with a positive mindset. Then we started with the basics. As time went by we watched her progress. She came to us for help with her own sums that she was working on at home, and also the ones that she got at school. Nomathemba stayed motivated and slowly started to love maths. We continued working with her for about 5 weeks, until she could no longer attend because her school had started their own after-school programme. When she left, we asked each other whether we had made any difference in her life. Shortly after we stopped working with Noma, while helping in the schools kitchen, Mrs. Kgosana told us about how disappointed she was that her daughter could no longer attend our classes. But she smiled at us and said “For the first time bafana bami bengiqala ukubona uSbongile ezimisele ngomsebenzi wakhe wesikole kakhulu ngezibhalo” which means “For the first time in my life, I have seen my daughter practicing maths and taking her school work seriously”. We smiled and both said, “WE HAVE MADE A DIFFERENCE.” We managed to change Noma’s attitude towards learning, as well as her negative mindset towards maths, and we have given her mother new hope that her daughter will make it. My name is Nkosinathi Ndlovu. I am 21 years old, from Jabulani, Soweto, and I serve at Winnie Ngwekazi Primary School in Pimville, Soweto. My service journey began in 2011 when I was still in college studying Business Administration. I was the Student Representative Council president and would assist management with campus projects. When I was not on campus over weekends, I would just sit around the house and do nothing constructive. A friend of mine, whose name was Phumlani Mkhize, was a City Year Service Leader. He was an idealist who always encouraged me to help and give back to our community, but I was very cynical and uninterested at first. Eventually he convinced me to spend a day serving with him at Siyavuma Primary School, which is near to where we live. As we entered the school gates the security welcomed Phumlani, and the first thing I noticed was the laughter and joy on the kid’s faces when they saw him. I watched him facilitate and play games with the children, and I joined in on the action. things he did during his year of service. I was so interested and intrigued by the whole concept, especially after what I had just experienced at the school, that I decided to apply to become a Service Leader. Once I had submitted my application, I was called in for an interview and shortly thereafter was accepted into the programme. My first day in the community of Pimville was nerve wracking. We had no idea what to expect as a team, but the staff at Winnie Ngwekazi were very welcoming and soon enough we managed to adapt to the different dynamics and conditions of the school and community. I started working with grade 5 learners in our City Year Children’s Club (CYCC), which is an after-school programme where we assist kids with their homework, reading and math’s. I absolutely loved working with the kids and I formed a special bond with a young boy named Menzi Ngubane. He was very brilliant and energetic, but lacked self esteem and rarely participated in any of the activities we had planned. Each and every day I would spend 10 to 15 minutes of our programme encouraging Menzi, but his behaviour remained the same, and I started to feel that there was no hope of changing his outlook. I continued motivating him every day, even though I felt discouraged, and then gradually I noticed his condition becoming better and better. Suddenly it struck me that he had been listening to me all along! 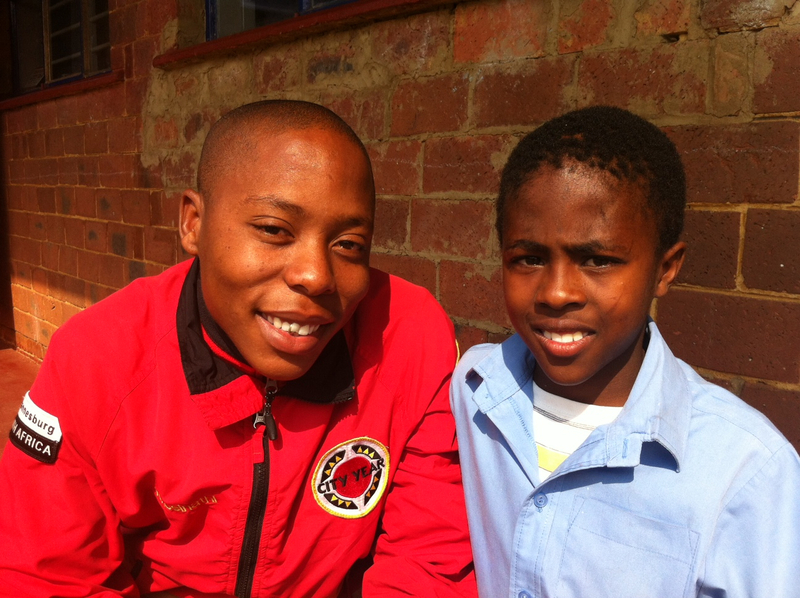 Now Menzi is actively engaged in all the CYCC activities and his self-esteem has visibly improved. Recently I gave my kids an assignment to write about who they want to be when they grow up. On the day of submission I looked at Menzi’s assignment and he had drawn a picture of a City Year Service Leader with the title: “My role model Nkosinathi Ndlovu”. I’d give 10 more years to serving my city, just to be a hero to someone 10 more times. 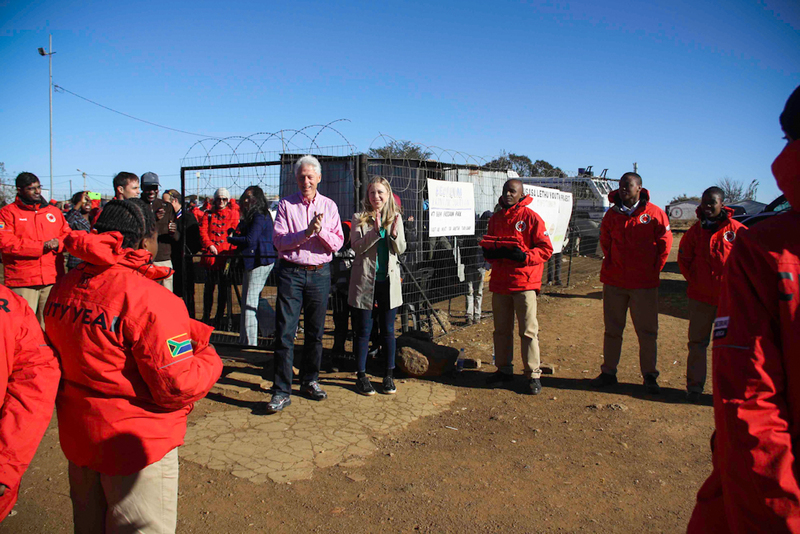 City Year South Africa was honoured yesterday to host former President Bill Clinton at a service event in Freedom Park, Soweto. 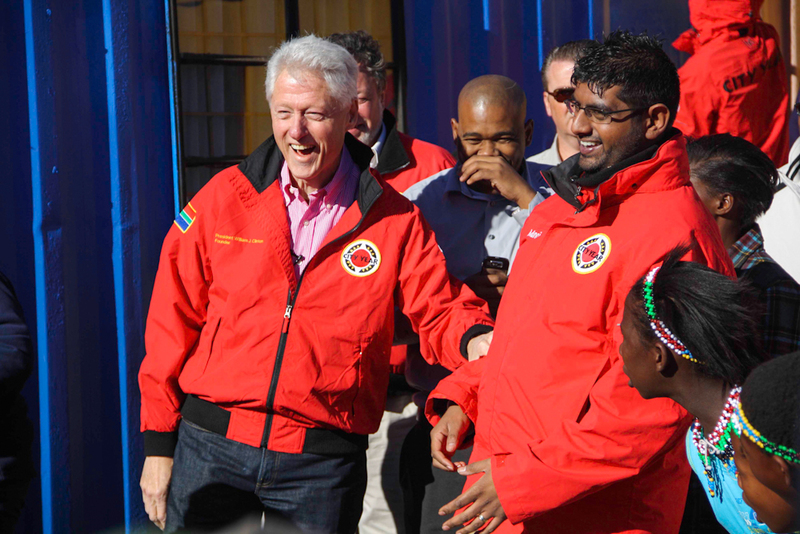 President Clinton, together with our former President Nelson Mandela played an important role in the founding of City Year South Africa. 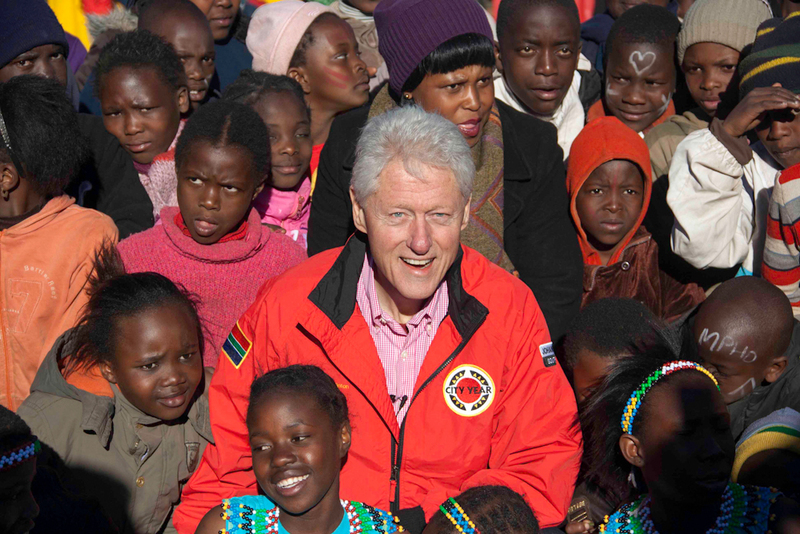 Hosting a conference on Civil Society in Cape Town in 2001, Mandela extended an invitation to Clinton, who accepted and brought along a delegation from the US, which included representatives from City Year Inc. It was after this conference that dialogue started about a possible City Year in South Africa and the site was officially launched in 2005. The event yesterday was held at the Ikusasa Lethu Youth Project, which serves the children and residents of the Freedom Park and Devland communities. Ikusasa Lethu (which means “Tomorrow is in our hands) serves three meals a day to almost 300 children and also provides home-based care to the elderly. 140 City Year South Africa Service Leaders and staff were on site from 11am preparing the project, which included repainting the outside walls of the centre, creating murals and new signage and helping to revamp the food garden, which is used to grow vegetables that are used in meals for the children. Service began at 2:30pm with over 200 community members, centre staff and the City Year team working to transform Ikusasa Lethu. President Clinton and his daughter Chelsea arrived at 3pm and were welcomed at the entrance by City Year’s power greeters. Both he hand his daughter were presented with City Year jackets, which they wore for the duration of the event. President Clinton went on a tour of Ikusasa Lethu, lead by Joey Monane, the project’s director. He stopped on numerous occasions to talk to children and Service Leaders he met along the way. After spending almost an hour interacting with all the volunteers and watching the amazingly speedy progress they were making with their work, President Clinton joined everyone for a group photo. 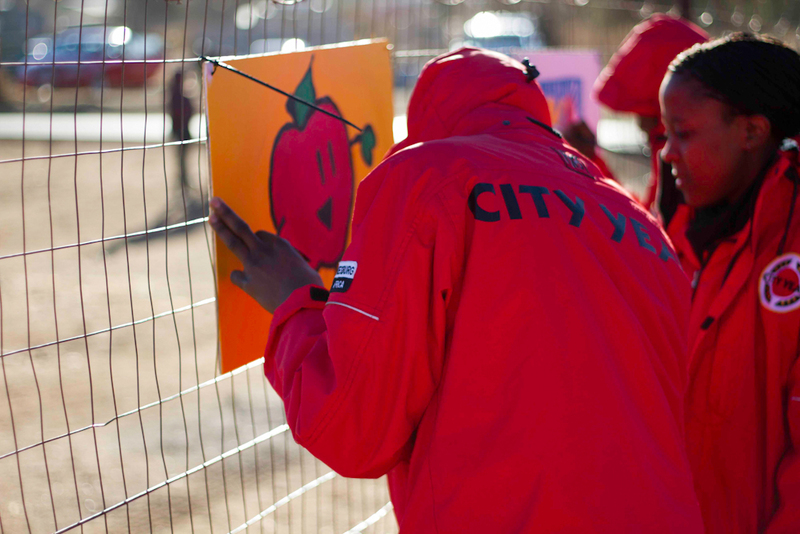 After his departure, City Year and the rest of the volunteers completed the remaining work, ultimately completely painting the outsides of 4 buildings, painting ten murals and a new sign, and creating 10 vegetable beds – all in just under 2 hours! All in all an amazing and inspirational day!